Myrddin01970 612 799work Self-cateringMyrddin is a spacious, stunning accommodation which is perfect for a large family/groups. Ideally located by the Marina and South Beach. The shops, restaurants, cafes, castle, pub, rail and bus station are all within easy walking distance. It has 6 bedrooms 2 King, 1 Doubles, 1 Single and 2 Twins - (1 being on the ground floor). 3 bathrooms - one on each floor - 2 showers, 2 baths and 4 toilets. A Dining room which seats 12 comfortably. A Games Room suitable for children and adults with a flat screen tv. Television lounge - 4K Smart Tv with seating for 12 and a log effect fire. Rear garage - ideal storage area for caneo's, kayak's, boards and bikes with rear access to the beach. Day to day stuff supplied as standard. Child friendly - supply cot, high chair and stair gate on request. 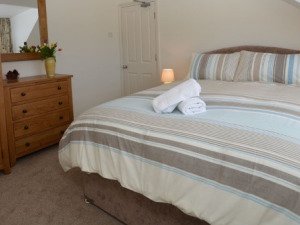 Myrddin is a spacious, stunning accommodation which is perfect for a large family/groups. 2 EV CHARGING POINTS FOR GUESTS STAYING AT MYRDDIN JUST 3 MILES AWAY FOC Unlimited Broadband and wifi throughout the house. Children welcome from any age. By Car: On entering Aberystwyth make you way towards the main promenade. When you get to the Pier follow the sea towards the castle and the marina. When you get to the ice cream kiosk on the sea front - opposite the castle turn left. You are now in south road. Approx 100 yards along the road on the right hand side is Rheidol Terrace. Turn in and the house is the first house on the right hand side.